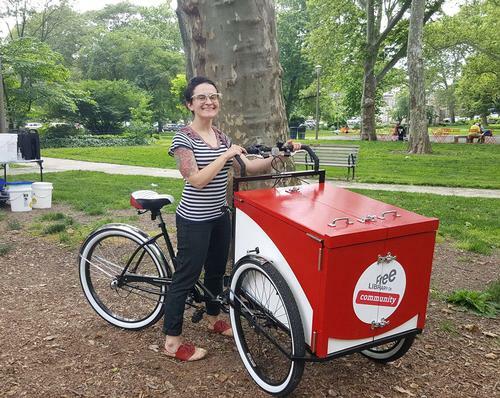 The Book Bike is a new program from the Free Library that sends bicycle-powered mobile libraries to outdoor events in Philadelphia. The custom cargo bicycles, built by Philadelphia-based Haley Tricycles, are ridden by a library staff member to community events and provide a selection of library materials. Patrons with library cards can check out books directly from the bike, learn about library services and programs, or even attend a storytime led by a librarian. The Book Bike has already started making appearances at community events including the Clark Park Farmers’ Market and Story Jams in Dickinson Square Park. At our first event at Clark Park this month, we brought more than 50 books catered to the audience at the Farmers’ Market about food, cooking, and culture. Children and adults alike were excited to see this unique display! We signed up several new patrons for library cards who were enthusiastic about starting to use the library. The Book Bikes will continue helping library outreach efforts at events throughout the city. View our schedule of upcoming events to see when the Book Bike will be at a location near you! 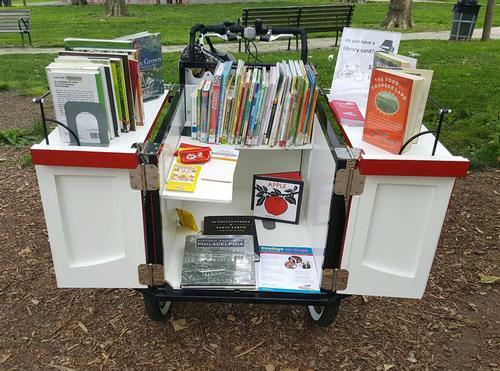 The Book Bike is a mobile library on wheels! Add a Comment to Here Comes The Book Bike!